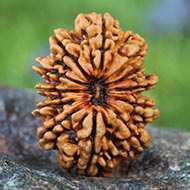 The term "Rudraksha" itself symbolizes Lord Shiva . 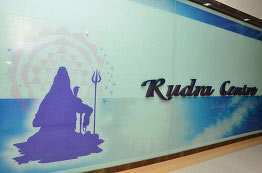 "Rudra" stands for Lord Shiva and "Aksha" for Shiva´s tears. Lord Shiva himself is the first ardent user and admirer of Rudraksha. Later devotees and sages began using Rudraksha as a blessing from Lord Shiva himself to protect mankind from worldly sufferings and miseries. 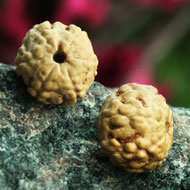 With the development of modern science, many scientists researched for evidences that support the ancient belief on the significance of Rudraksha. 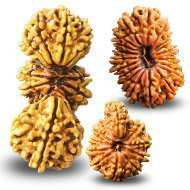 All the scientists came up with the findings that reassured and confirmed the divine power of Rudraksha beads. Individual from every walk of life irrespective of caste, creed, religion, nationality or gender can use Rudraksha to gain maximum spiritual, physical and materialistic benefits. 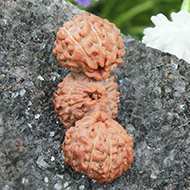 Three mukhi Rudraksha represents "Fire" God Agnidev. 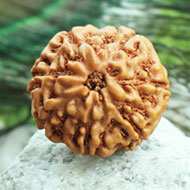 Wearing of this rudraksha frees the person from bondages of his past birth karma and paves way for success by deeds in this birth. It is said that the wearer of 3 mukhi never takes birth again, means he gets Moksha. Wearer is released from past memories of hurt, shame, anger, low self esteem and he rises and shines to reveal his illuminated true pure self. Heals stomach and liver ailments. Four mukhi represents God Brahaspati who rules Jupiter. The wearer gains power of knowledge and creativity. Expands memory power, vocal power, wit and intelligence. Wearer is blessed with melodious speech. Five mukhi represents Rudra Kalagni. 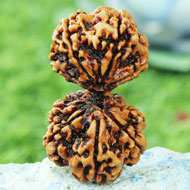 This highly auspicious rudraksha is important for people who wish to discover their higher selves meaning UpaGuru. Enhances awareness, memory, word power and intellect. This it is extensively used in malas for wearing and chanting mantras. 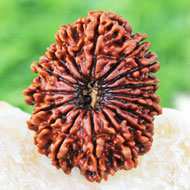 This highly auspicious rudraksha connects wearer to grace of Lord Shiva. Removes malefics of planet Jupiter. It removes malefic effects of planet Jupiter, It enhances one's intellect and self-awareness, It is extensively used for wearing and chanting mantras, It cultivates Wisdom and intellect. Six Mukhi Rudraksha is ruled by Kartikeya, the six headed son of Lord Shiva who represents the senses. 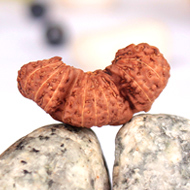 Â Six mukhi rudraksha bestows on the wearer the fulfillment of desires and youthful appearance. Lord Kartikeya is the warrior and has the qualities of fearlessness, quick action and supreme command. The wearer of 6 mukhi rudraksha is blessed with the qualities of Lord Kartikeya. The planet associated with this bead is Mars. Mars rules our animal instincts of aggression, anger, survival and instability in oneâ€™s life. 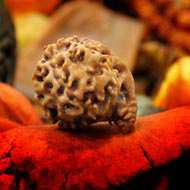 6 mukhi rudraksha helps to pacify the malefic effects of planet Mars. People who have Mangal Dosha in their Kundali benefit from this bead. 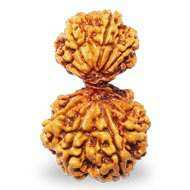 Seven mukhi Rudraksha represents Goddess Mahalaxmi, the Goddess of wealth. Wearer is blessed with good health, wealth and new opportunities. It should be worn by those who are suffering from miseries related to finance and luck. 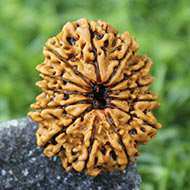 By wearing Seven Faced Rudraksha the person progresses steadily in life with name and fame and abundance. Significance: Seven mukhi Rudraksha gives prosperity, happiness and contentment to the wearer, Â It removes the miseries, bad luck and misfortune, It pacifies the negative influence and afflictions of Venus, It gives the wearer, peace of mind, abundance and harmony in relationships. Eight mukhi Rudraksha bead is a symbol of Lord Ganesha the son of Lord Shiva. Ganesha is Vighneshvara or Vighnaraja or "Vighnaharta", the remover of Obstacles in the path of success. Ganesh symbolizes supreme devotion to Parents and connection with the Roots to achieve stability and strength to overcome all hurdles. 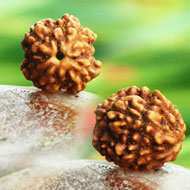 Eight mukhi rudraksha bestows wisdom on it's wearer and attracts support and stability in his life. The wearer becomes free from the fear of failure in any kind of undertakings in his life. It improves the ability to face challenges in life. The planet associated with Eight Mukhi is Ketu. Ketu is the celestial snake that causes obstacles in one's journey of life. Nine mukhi Rudraksha is ruled by the Divine mother Durga. The wearer is blessed with lots of energy, powers, dynamism and fearlessness, which are needed to live a life of success. Gives Bhogha (worldly comforts and desire fulfillment ) and Moksha (liberation). The wearer of 9 mukhi remains free from fear of ghosts and evil souls, Nine mukhi Rudraksha help win over all kinds of enemies, It increases connection with Goddess Durga and blesses with power of destroying sins & worries, It removes the malefic effects of the planet Rahu. 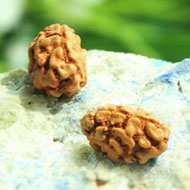 Ten mukhi rudraksha is ruled by Lord Krishna Avatar of Lord Narayan. One who wears it, gets eternal peace. 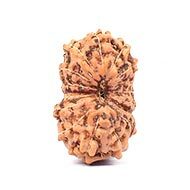 This rudraksha works like a shield on one's body and the wearer gets immense protection from negative energies, evil eye and psychic attacts. 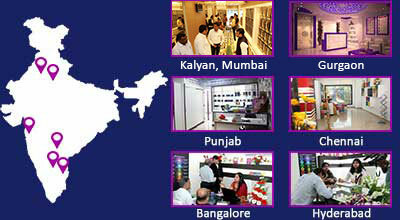 Gives success in court cases, land deals and relieves wearer from debts and losses. 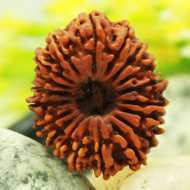 This rudraksha is mentioned in ancient texts as one of the most powerful rudraksha which pacifies all the nine planets. It showers blessings from Lord Krishna, thus wearer is protected from evil eyes, spirits, ghosts black magic, It makes life joyful by releasing fears and give power of creation, It increases connection with Lord Krishna and blesses with Joy, happiness and fruitful relationships. It is an aid in meditation and spiritual sadhana, It helps in increased concentration, memory and creativity, It blesses the wearer with wisdom and self-confidence. 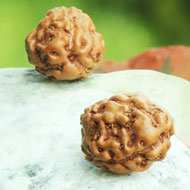 12 mukhi Rudraksha is ruled by Lord Sun. Wearer gets the quality of the sun - to rule and shine with brilliance, radiance and power. Releases stress, anger, worries, suspicion and low self esteem. Wearer is blessed with confidence, self power, energy and motivation in life. 14 mukhi Rudraksha is the most precious divine gem - Deva Mani. It is ruled by the mighty Hanuman. Infuses wearer with a strong will, a brave heart and the courage to overcome all odds. Lord Hanuman is considered to be an incarnation of Lord Shiva. Shri Hanuman is the epitome of sincere devotion and dedication, being a great disciple of Lord Rama. 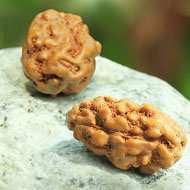 14 mukhi Rudraksha invokes The Hanuman in us, which is being fearlessness and doing what comes naturally to us, maintaining a balanced and steady approach and Identifying our latent potential.This rudraksha is the ultimate protector from the evil effects of Mars and thus pacifies mangal dosha in a chart. For : Cure of diseases, protection, release of fears and insecurities. Liberation from the fear of death. 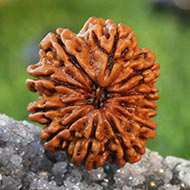 16 mukhi rudraksha is Mahamrityunjaya form of Lord Shiva. The wearer becomes fearless & gets victory against the most fearsome of diseases and most adverse circumstances. It protects from physical illness, negative people and negative energies. This protects from physical illness due to placement of planets. If one has fear of loss of a loved one or fear of loss of name and fame or loss of faith in oneself or God or fear of death, or nightmares then one should wear the mahamrityunjaya rudraksha which is 16 mukhi. 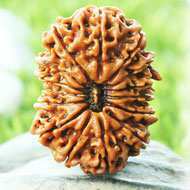 Wearing this rudraksha is equivalent to chanting the Mahamritunjaya mantra 125000 times everyday. Even Yama the Lord of Death turns back from the wearer of this rudraksha.The path of the wearer become surmountable by grace of Lord Shiva and he rises in Victory and grace. 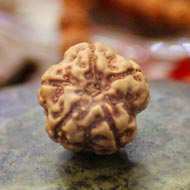 17 mukhi rudraksha is ruled by Vishakarma, builder of this Universe. 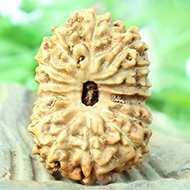 Wearer of this Rudraksha gets fruits of Dharma, Artha, Kama and Moksha Wearer lives with immense power and divine magnetism. Very useful for project leaders, businessmen and political leaders and people desiring growth in career and luck. Gets freedom from diseases, losses, sadness and fears. Gives fulfillment of all desires related to getting a life partner, progeny, good luck and prosperity. Removes obstacles in path and gives immense prosperity. 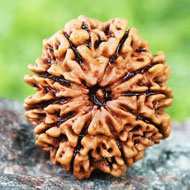 According to Katyani tantra this rudraksha is ruled by Mata Katyani who is sixth form of Goddess Durga. 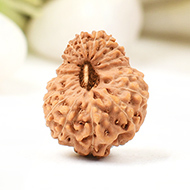 Wearer of this rudraksha is blessed with immense fortune, sudden wealth and fulfillment of all materialistic desires. 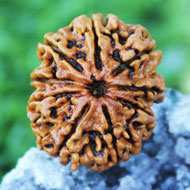 19 mukhi is a very rare rudraksha ruled by Lord Narayana the supreme of all Gods. The wearer never has lack of anything in life. 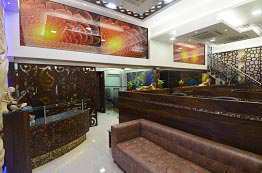 It gives immense wealth, success in business, abundance in all spheres and good health.. It removes obstacles in job/business/education and removes planetary afflictions. The wearer attracts perfect life partner. 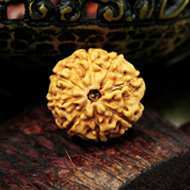 This rare Rudraksha is ruled by the Creator of the Universe, Lord Brahma. Gives blessings of attainment of divine knowledge in Creation, sciences, arts and music. Wearer becomes the Creator with immense knowledge and intellect. Wearer is blessed with immense power, wealth and fulfillment of desires. Worn by those who desire to manifest projects for the benefit of humanity. 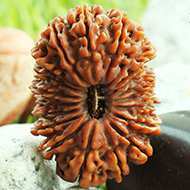 This rarest of the rare Rudraksha is ruled by Kubera, the Lord of wealth. The wearer is blessed with immense properity and fulfillment of pleasures and materialistic desires. Removes all kinds of diseases. Even if a poor person wears it, he becomes rich. 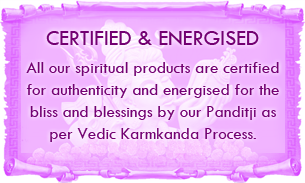 Gives the wearer immense protection from any kind of tantra and malefics. Kubera also enjoys the titles ”king of the whole world", "king of kings" (Rajaraja), "Lord of wealth" (Dhanadhipati) and "giver of wealth" (Dhanada).Kubera also acquired the status of the "Lord of riches" and the wealthiest Deva. He also becomes a Loka-pala ("world protector") and guardian (dik-pala) of the North direction. Kubera is also the guardian of travelers and the giver of wealth to individuals who please him and Kameshvara ("Lord of Kama – pleasure, desire etc." 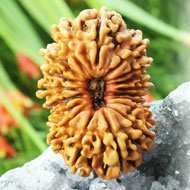 This is a kind of Rudraksha which bears Trunk like elevation as is seen on the face of Lord Ganesh. It is called Ganesh Rudraksha. It provides the worshipper perfection in every sphere in life. Garbh Gauri Rudraksha features the two beads naturally joined together with one being smaller than the other. The bigger one represents the divine Parvati, wife of Lord Shiva and the smaller one represents Lord Ganesha, their son. Gauri Shankar rudraksha is the Unified form of Shiva & Parvati represented by two naturally joined rudraksha. It opens up the Hrit Padma chakra and aligns oneself with Universal love. Aids Dhyan and meditation. Harmonizes relationships of the wearer. 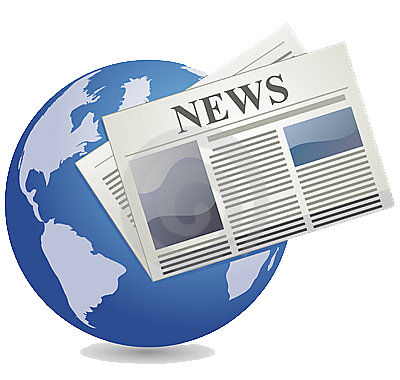 Expands sphere of influence to love one and all. 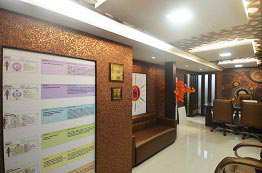 Attracts a suitable life partner by grace of Shiva and Shakti. 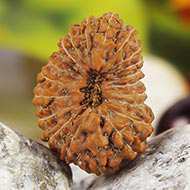 Three naturally joined Rudrakshas is one of the rarest rudraksha and is called Trijuti. 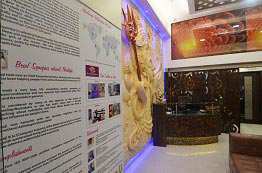 It represents the three main Hindu gods: Brahma, Vishnu and Shiva. Wearing of this bead, gives the wearer immense power for great and rare achievements in the world and expands his Universal conciousness. Ideal for leaders, project managers and Spiritual seekers.